Nepal's Prime Minister Khadga Prasad Sharma Oli is currently in China on a five-day visit from June 19. The visit carries historic significance given its timing and agenda. Both Nepal and China have developed an environment conducive to forging ahead with a comprehensive partnership so as to redefine and take their bilateral relations to a new high. Nepal has achieved political stability under the leadership of the Communist Party of Nepal (CPN). 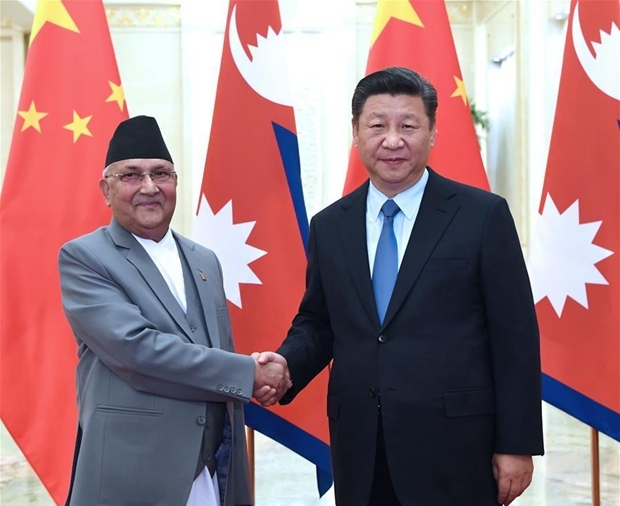 PM Oli, also the chairman of CPN, is visiting China with conviction that the northern neighbor will wholeheartedly support the rebuilding of Nepal's economy, which is shattered by decades of political turmoil and the 2015 Gorkha Earthquake. Chinese cooperation is also critical to realize his agenda of "prosperity" – the main plank on which he swept the three-tier polls held last year. Oli will primarily focus on implementing the 10-point agreement, including on transit and transport which was signed between Nepal and China during his first premiership in 2016. Those vital deals could not be executed owing largely to the unfavorable political climate at home. Now Oli leads a strong government, which has a two-thirds majority in the parliament, and he is unlikely to face obstacles from the weak opposition and indolent bureaucracy. This time around he is under little geopolitical pressure, especially from India and Western powers when it comes to materializing important accords reached with China. Two months ago, he visited India and succeeded in normalizing ties. With improved relations with India, some detractors doubt whether PM Oli will push for bilateral cooperation with China in the same spirit that he did during his first term in office when the nation was hit hard by the Indian blockade. Oli seems determined to silence his traducers from both the ultra-left and right camps that are questioning his nationalistic credentials. Against this backdrop, his China visit is also a litmus test of his nationalism, which he previously exhibited when standing up to the Indian blockade and bullying. During his visit, Nepal and China will sign scores of projects under the framework of the Belt and Road Initiative (BRI) that largely seek to boost Trans-Himalayan Multidimensional Connectivity. They cover road, rail, energy, cross-border transmission lines, infrastructure and agriculture development, trade, investment, disaster management and people to people relations. With political stability in Nepal, it has become a favorable destination for the Chinese investors. They can tap many "virgin" areas of investment here with cheap labor costs and demographic dividends. First and foremost, PM Oli needs to win the political trust of the Chinese leadership eager to expand Sino-Nepalese relations to new heights. Oli meeting with Chinese President Xi Jinping seeks to forge a high-level understanding and renew relations based on the dynamics of the 21st century. China is not only Nepal's immediate neighbor. It is also a global power with growing clout in the international affairs. The increasing economic cooperation and bonhomie with China provides Nepal with important diplomatic leverage to deal with other nations. A robust relationship with China is propitious for Nepal from other points of view. This strengthens Nepal's competitive strengths. Unlike other international powers, China promotes the national sovereignty of Nepal, does not impose its political system and supports the development of its basic infrastructure, thereby creating win-win situation for the both. For China, a stable Nepal is the key to implementing its development projects under the BRI framework. China sees Nepal as a gateway to the South Asia with a huge market. So, increasing Sino-Nepalese ties contributes to obtaining stability and economic growth in the region. Nepal and China are all-weather friends and have helped each other in times of crisis. Nepal had played an important role to ensure China's legitimate place in the United Nations in 1971. It has steadfastly followed the "One China Policy" and never allowed its soil to be used against China. As a trustworthy neighbor, Nepal quickly disarmed and punished the Khampa rebels that were trying to destabilize Tibet from Nepal's northern border. China has extended economic, diplomatic and moral support to Nepal during the critical periods. In 2015 when Nepal endured the brutal Indian blockade, China came to rescue Nepal and offered petroleum products free of cost. Its humanitarian cooperation during the earthquake is unforgettable. Thus, the leaders of two nations bear these historical references in mind as they move to seize on new opportunities to take their bilateral bond to a new high. Ritu Raj Subedi is an associate editor of The Rising Nepal. Opinion articles reflect the views of their authors, not necessarily those of www.kilc.com.cn. The leaders of two nations will bear friendly historical references in mind as they move to seize on new opportunities to take their bilateral bond to a new high.